Managing today’s new laboratory construction projects is an increasing challenge. We look at ways you can simplify your project management demands while getting more for your dollar. We hear that so often, but how can you make it happen? The answer is to turn to a company that can do more for you, without the added complexity of dealing with multiple vendors. That sounds good, but how does it work in practice? Let’s step through a recent Formaspace project – a new $17 million innovation center built by a leading medical device manufacturer known for inventing the world’s smallest FDA approved heart pump – to find out. The new 29,800 ft.² center in Danvers, Massachusetts features five new laboratories, including blood, optical, software, mechanical, and electrical labs – all equipped with custom-made Formaspace lab furniture. In addition to the research labs, the new facility also incorporates a new medical device manufacturing line, plus a cutting-edge heart recovery clinical training facility. During the project planning stage, the client recognized that its new innovation center required careful planning and vendor selection to avoid unwanted delays or other unexpected problems. Of particular concern was the build-out of the five different laboratories (blood, optical, software, mechanical, and electrical), each of which had its own specific functional requirements. Project managers believed that assigning a different vendor to each of the laboratories would create unnecessary complications in the project planning and build process. So instead, they turned to Formaspace to take on the building of the custom furniture for each of the five new laboratories as well as the responsibility for sourcing the necessary lab equipment. The client had confidence in Formaspace for three reasons: first, we have a long-standing working relationship, having built other laboratory projects for them in the past; second, we have the necessary design and manufacturing capability here at our headquarters in Austin, Texas, to take on a wide range of large, highly technical laboratory projects; and third, having one vendor responsible for all the laboratory furniture and equipment – with a single point of contact – simplified the client’s project planning process considerably. You can learn about many other high-profile laboratory projects on the Formaspace website. Here is a short video on a recent project for Ariosa, a Molecular Diagnostics Test service provider (a division of Roche). For the office furnishings used in the new innovation center, the client’s project managers selected another company that they have had a long-term business relationship with, Creative Office Pavilion (COP), a Herman Miller dealer based in New York. Under the able leadership of COP, the new innovation center’s administrative departments, reception areas, conference rooms, etc. were kitted out with new Herman Miller office furniture. Working together with COP, we were able to deliver exactly what the client was looking for, thanks to a streamlined communication process among a small number of very experienced, pro-active vendors who worked together in close partnership to get the job done right the first time around. Lab Project Insight 2: Stock Designs Don’t Always Fit. Get Exactly What You Need from a Custom Lab Furniture Manufacturer. For the new innovation center, Formaspace manufactured new custom casework, ESD lab benches, chemically resistant lab benches, cabinetry, fume hoods, and safety showers here at our factory headquarters in Austin, Texas. Given the sensitive nature of working with medical devices (heart pumps in this case), the working surfaces of the furniture destined for the blood laboratory needed to eliminate physical joints or other areas that would be difficult to sterilize. As a result, we built a 24-foot long casework assembly with a one single seamless stainless steel surface. Due to its immense length, a portion of the partition wall in the lab needed to be temporarily removed to allow access during the final on-site installation. To ensure quality during the medical device manufacturing stage, as well as to provide support for new product development, the new SEM laboratories feature high-power magnification capabilities that give product developers and quality inspectors the ability to peer deep inside devices. Given the high investment cost of equipment and its relative sensitivity, the custom Benchmarx™ workstation made by Formaspace provides a stable foundation that prevents excessive vibration and helps protect the SEM equipment investment. In addition to developing and manufacturing sophisticated medical devices, the client also produces sophisticated software to accompany their products. These software products include tools to test and calibrate medical devices, as well as apps that can assist nurses, perfusionists, and physicians working in catheterization labs, intensive care units, or operating rooms, with vital information on the client’s product use and performance. The new tech lab allows quality assurance specialists to perform rigorous testing on all software applications. One of the largest laboratories at the new innovation center is the electrical device testing laboratory, which features a combination of 35 lab benches, each of which comes equipped with built-in ESD electronic discharge prevention measures that help prevent accidental destruction of highly sensitive electronic equipment from unwanted static discharge. To ensure safety, the new innovation lab provides a separate area for laboratory functions that require working with materials that have the potential to be flammable or to emit toxic fumes. This area, which is shared among the different laboratories, includes 24 lab benches with built-in casework, fume hoods, safety showers, and safety cabinets for flammable materials. The new innovation center uses the combination of Formaspace-designed and manufactured casework furniture as well as our modular furniture designs. Mobile furniture provides flexibility. These custom lab storage units (with hidden casters) can be wheeled into place, then moved to storage or other locations when not in use. Of course, as we’ve written before, there are pros and cons for specifying either kind of furniture, and sometimes the right solution (as in the case with this project) is specifying a combination of both. But, when you’re contemplating construction of a new facility, it’s useful to keep in mind that there are often more favorable tax treatments when you specify modular furniture, mobile carts, or other furniture items that can be easily moved. Why? Casework furniture installations are attached to the building, and as such, the depreciation takes place over a longer timeframe (often 30 years). While modular and mobile furniture installations can be depreciated at a much faster rate, often within a few years. Of course, we can’t offer tax advice for your situation (please consult with your accountant and tax attorney for that), but it’s something to consider if you are building a large-scale project and are looking to maximize your financial position over the lifetime of a new laboratory building. The project planners in charge of the new innovation center wanted to find a vendor who could provide high-quality furniture that was versatile, resilient, and long-lasting. They were also looking for a laboratory furniture manufacturer who was dealer-friendly and could work as a team player while reducing the number of points of contact necessary to accomplish the project goals. The fact that all of Formaspace’s products are designed and manufactured in the USA here at our Austin, Texas factory headquarters helped simplified the project management process immeasurably. We were able to provide a one-stop shop for all their laboratory needs, not only by manufacturing custom laboratory furniture, but also serving as a resource to take responsibility for ordering other ancillary lab equipment, which greatly simplified the project planning demands placed on the client’s team. There are other advantages to specifying American-made products as well. Because we source our steel and other materials here in the USA, we know our suppliers and can guarantee the exceptional high-quality of the materials that go into our finished products. Unlike overseas vendors from Europe or China, our products can be shipped quickly. We not only promise 100% on-time production. We offer rapid delivery anywhere across the country. Professional on-site installation services are also part of our offering. In the case of the innovation center, Formaspace was able to work closely with COP to install the lab furnishings in just two visits – the first for the casework installation, and the second to deliver and install the lab benches. 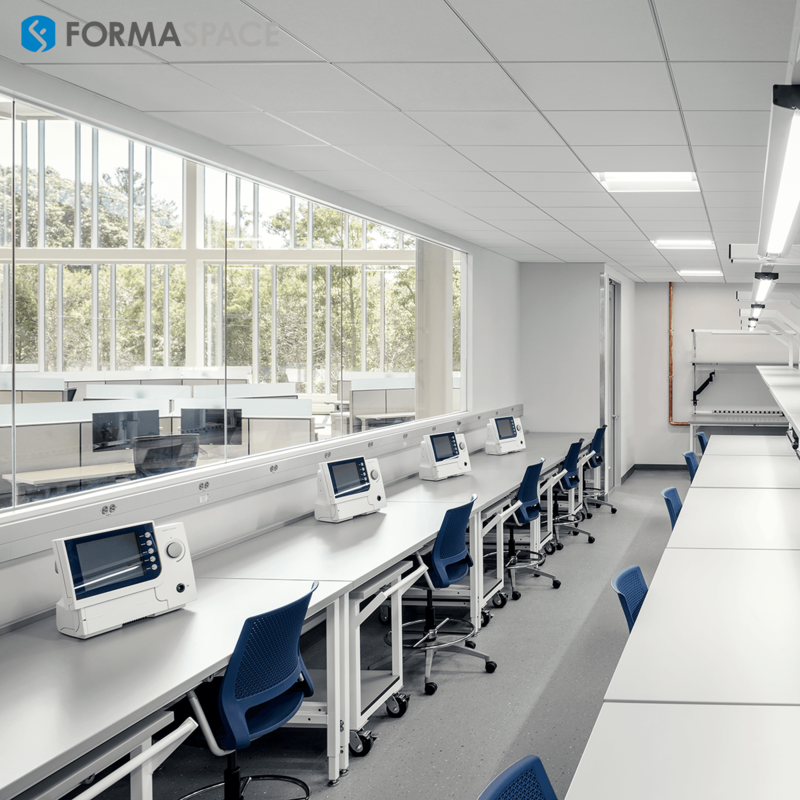 The bottom line is when you are looking to build a new laboratory or a remodel an existing facility, you should contact Formaspace to see how we can work together to make your project a success. We are your laboratory partner, providing essential design and manufacturing capabilities, as well a project management services, including sourcing all the necessary lab equipment required for your project. We can also provide full-service, on-site installations. If you can imagine it, we can build it, right here at our factory headquarters located in Austin, Texas. We’ve been building top-quality laboratory and industrial furniture for the top name clients since 1981. You’ll be interested to note that three out of four of our corporate clients are listed on the Fortune 500 and that we also count over 350 colleges and universities, including most of the Ivy League schools, among our satisfied customers. Want to find out more? We are ready to assist. Contact your local Formaspace design consultant or design your own lab bench online with 3DConfigure.